PRESS RELEASE: Steinberg Media Technologies GmbH today is proud to announce the release of WaveLab's latest incarnation, WaveLab 7. Adding new facilities to its previous versions for Windows, the seventh version now also sets a benchmark for audio editing and mastering under Mac OS X. Its feature list includes the revamped graphical user interface which provides eminently convenient handling of audio material across multiple windows, montages and podcasts with an intelligent docking and scaling system. Brand-new VST3 plug-ins and restoration tools, the new, future-proof burning engine and its flexible multiprocessing capabilities are further highlights. WaveLab 7 is available as boxed version in the Steinberg Online Shop and from authorized Steinberg resellers for EUR 599*/GBP 497*. The stripped-down version, WaveLab Elements 7, is available as boxed and download version for EUR 99*/GBP 82*. 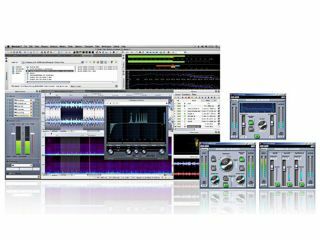 "By releasing WaveLab 7, Steinberg's range of products now encompasses an A-to-Z solution on PC and Mac computers that offers industry-standard tools all the way from music creation, production and mixing right straight down to the final master," comments Timo Wildenhain, Steinberg's product marketing manager for WaveLab. "This milestone release reflects Steinberg's commitment to cross-platform support, closing the circle to offer its current product range to both the Windows and Mac OS X platforms," Wildenhain continues. Reengineered from top to bottom, WaveLab 7 introduces several novelties to its user interface which makes working with audio much more intuitive as well as expediting workflows in audio editing and mastering with a convenient, completely customizable window and toolbar management system. WaveLab 7 also includes a restoration tool package encompassing specialized DeNoiser, DeBuzzer and DeClicker plug-ins by leading plug-in manufacturer Sonnox plus 30 new VST3 plug-ins for further processing, expanding the depth of WaveLab's vast range of functionality. DDP support and the entirely new CD and DVD-A burning engine are features that round out the functional additions to WaveLab 7. WaveLab 7 is the comprehensive audio editing and mastering software application which may be used to record, edit, restore and publish audio by hobbyists and professional mastering engineers alike. * Suggested Retail Price includes VAT. Prices may be subject to regional variations.